One of the most contemporary, effective and safe therapies, that Aesthetic surgery has to offer today, is the disappearance or alleviation of facial wrinkles by using a medicine called “Hyaluronic Acid”. 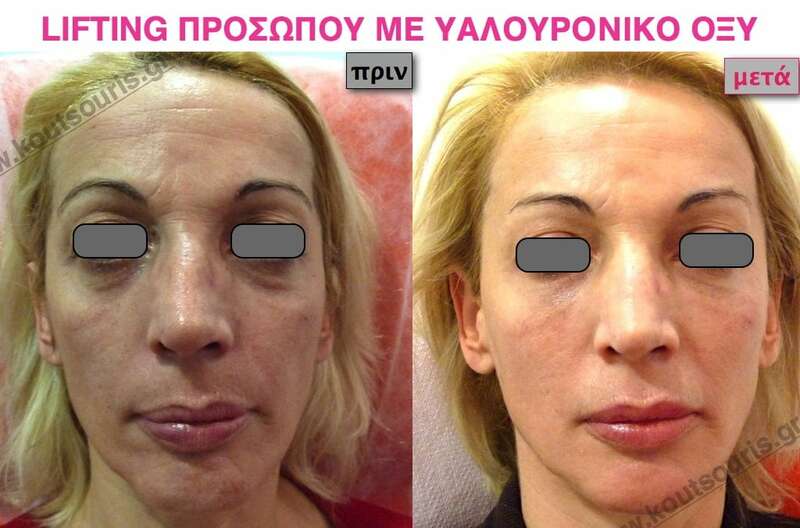 It is considered to be an alternative, combination therapy, able to improve or correct the imperfections of the facial features, giving a perfectly natural result without having surgery. The Hyaluronic Acid is an innovative implant of the Plastic Surgery, which gives us the opportunity to safely improve or perfect the facial features in a bloodless and almost painless way and in a very short recovery time. Having these principles in mind, the Hyaluronic Acid is the ultimate tool of the contemporary Plastic Surgery in order to achieve pleasant results in a safe way. The proper application of the injectable implant of Hyaluronic Acid gives us the opportunity to achieve impressive results in the fight against wrinkles and the correction of the facial atrophic spots. The improvement of facial features by applying injectable Hyaluronic Acid is considered to be an innovative and contemporary therapy, which is addressed to both women and men of almost all ages. But what does exactly the Hyaluronic Acid is? First things first, we have to make clear that the Hyaluronic Acid is not considered to be an “acid” according to the term’s ordinary meaning. It does not “burn” the tissues, since the term “acid” refers to its biochemical substance type. The Hyaluronic Acid is a glucosamine protein, i.e. a molecule which exists in nature just as it is. It constitutes the main structural component of the human organism and it is identical in most types of organisms and in all tissue types. Simply said, the Hyaluronic Acid molecules existing on our skin as well as on the skin of all mammals, along with elastin and collagen molecules, which are produced at a constant rate by cells, called fibroblasts. These substances are macromolecular compounds, found in all mammals in the form of protein chains, intertwined with each other, creating the tissue that we recognize as “skin”. In addition to fibroblasts, there are also some other cells, known as fibrocytes, whose main role is to break down the Hyaluronic Acid molecules. 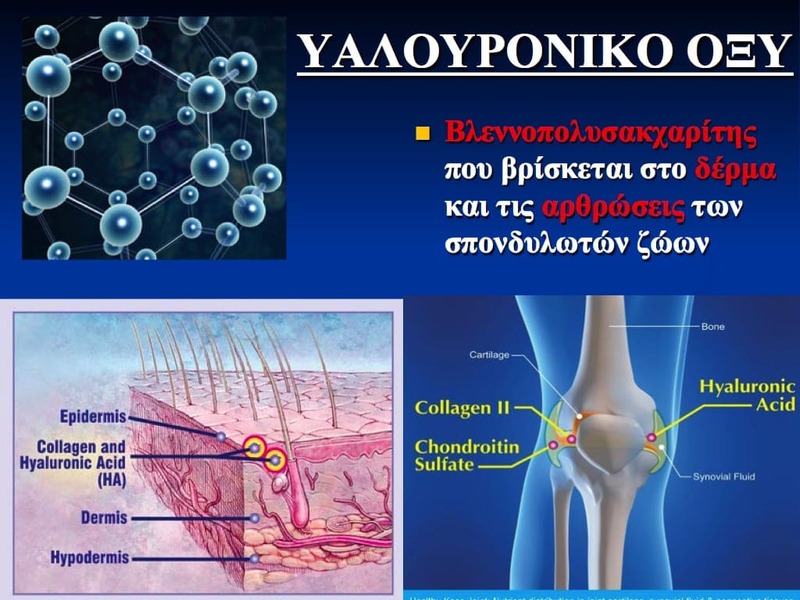 The synthesis and degradation of Hyaluronic acid produced by our organism, is a dynamic process between fibroblasts and fibrocytes, in order to maintain the balance. As much as the Hyaluronic Acid is produced, it is re-cleaved. This process is usually completed within 24 to 48 hours in the human body. Over the years, the fibroblasts degenerate and decrease in number, a fact that makes the skin thinner, losing its volume and firmness. Provided that the Hyaluronic Acid is an extremely hydrophilic molecule (binding up to 1000 times its weight in water), its loss as a structural component of tissues leads to an image of a dehydrated, thin and fragile skin, predisposed to the appearance of fine wrinkles, atrophic spots and deep skin folds. In 1996 in Uppsala, Sweden, it was produced Hyaluronic Acid in the laboratory, with similar synthesis to that of the human body. It is a non-animal stabilized Hyaluronic Acid molecule, a product of genetic engineering. 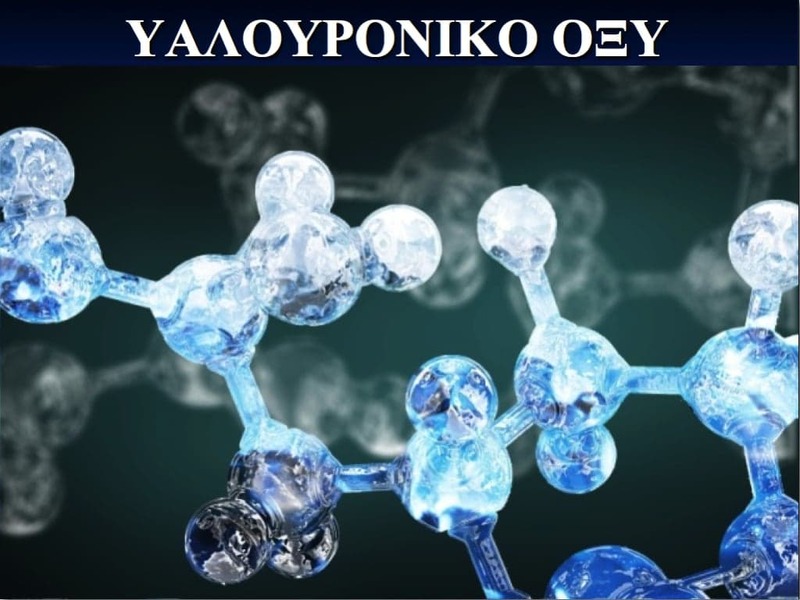 The difference between Hyaluronic Acid produced in the laboratory with that of the human body ranges only about 1%, so that the human organism cannot easily break it down. What would be the point of producing Hyaluronic Acid in the laboratory, exactly similar to that of the human organism, since its life-expectancy would be only for a few hours? As shown in the picture below, the Hyaluronic Acid produced in the laboratory is a viscous, transparent material and is found in gel form into a syringe. Assuming then that we have a wrinkle, we inject the Hyaluronic Acid with the help of a very fine needle at the base of the wrinkle, filling the volume deficit – thus alleviating or soothing the depth of the wrinkle. Since the Hyaluronic Acid that we inject at the depth of the wrinkle is totally compatible with the human tissues, it is fully incorporated in them and constitutes the structural component of the human body, a fact that is usually difficult to be observed after a few of days of its application. What is the mechanism of action of the injectable Hyaluronic acid? The Hyaluronic Acid as a structural component of our human organism, when is injected into the skin, fills and gives volume to the tissues. Since the Hyaluronic Acid is highly hydrophilic molecule, it absorbs water, a fact that offers a deep hydration to the areas, where the Hyaluronic Acid is applicable. This is the answer why the face looks more vivid, brighter and fresher after the application of injectable Hyaluronic Acid. On which areas of the face do we apply Hyaluronic Acid? As mentioned above, the Hyaluronic Acid is found in different types of density in order to be effective on all wrinkle types. In addition to the facial areas, can the Hyaluronic Acid be used on other areas of the body? Since the Hyaluronic Acid is an extremely inert material, it can be easily used on other parts of the body, providing solutions to problems of asymmetry or atrophy tissues. smoothen the skin from acne or post-traumatic scars. The Hyaluronic Acid can be also used in reconstructive plastic surgery for the restoration of soft tissue volume or the correction of soft tissue defects, which have been appeared after oncologic surgery or wound-healing interventions. 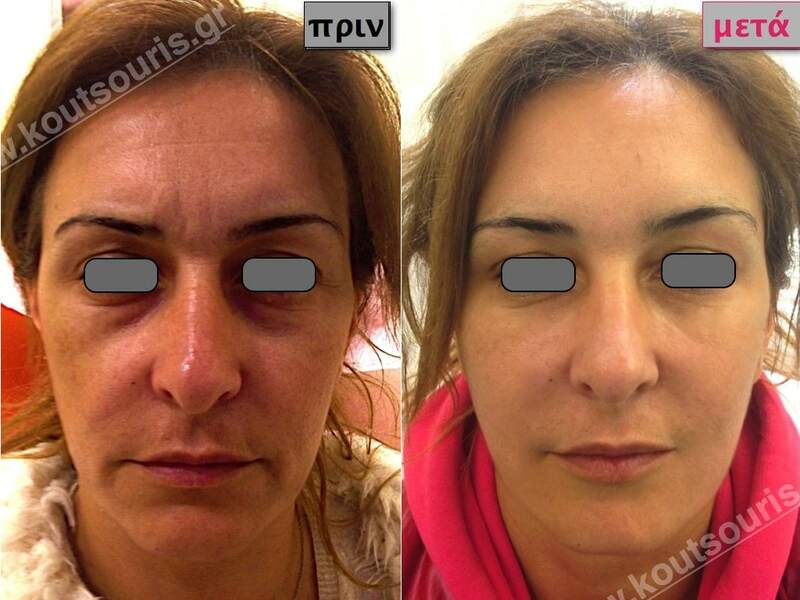 What is the application procedure of the injectable Hyaluronic Acid? As mentioned above the injectable Hyaluronic Acid is found also in the form of a viscous gel. It is a transparent, colorless and odorless gel, which is easily injected into the tissues with the help of a very fine needle. The Hyaluronic Acid can be found in two or three different types of density, depending on the skin type or the thickness of the wrinkle. So, when we have deep wrinkles, such as those on the nasomalar grooves, it is more preferable to inject Hyaluronic Acid of higher density on the depth and the base of the wrinkle and of lower density close to the skin surface. By applying a more viscous Hyaluronic Acid on the depth of the wrinkle, we add more volume and we “lift” the wrinkle, while the Hyaluronic Acid of lower viscosity totally smoothens the skin folds. (As shown in the pictures below). 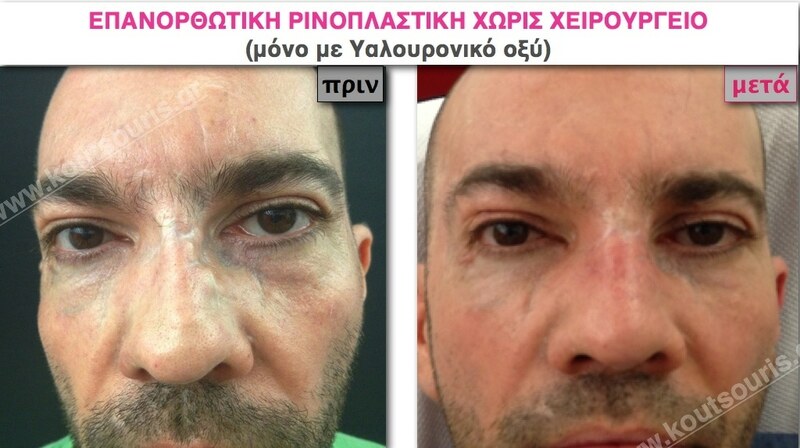 Does the application of the injectable Hyaluronic Acid hurt? The treatment normally takes place at the clinic. It is an almost painless procedure, since it is always used a local anesthetic cream or local anesthesia. How long does this procedure take and what should we do afterwards? 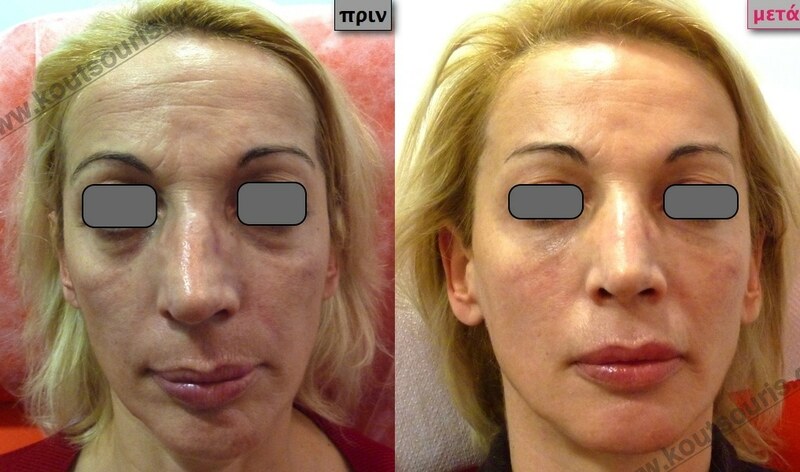 The whole procedure takes 30-40 minutes and the results are immediately visible. After the treatment it is required to apply ice at the injection sites for 2 hours approximately. Afterwards it may appear a slight skin irritation and swelling at the injection sites, which usually disappear within 24-48 hours and can be easily covered with the use of make-up. In the case of lip treatments the swelling may last a little longer, as the area of the lips is usually more sensitive. 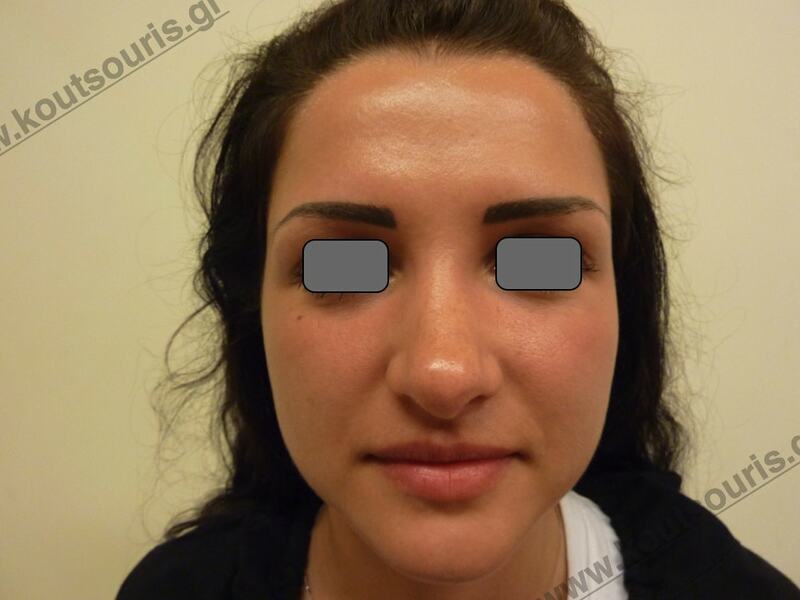 How can we correct the glabella wrinkles, i.e. the wrinkles between the eyebrows? The wrinkles, which are formed over the years between the eyebrows, are a result of chronic muscular contraction of three muscles located in the glabella region: the pyramidalis muscle (centrally) and the two corrugator supercilii muscles (one on each side). 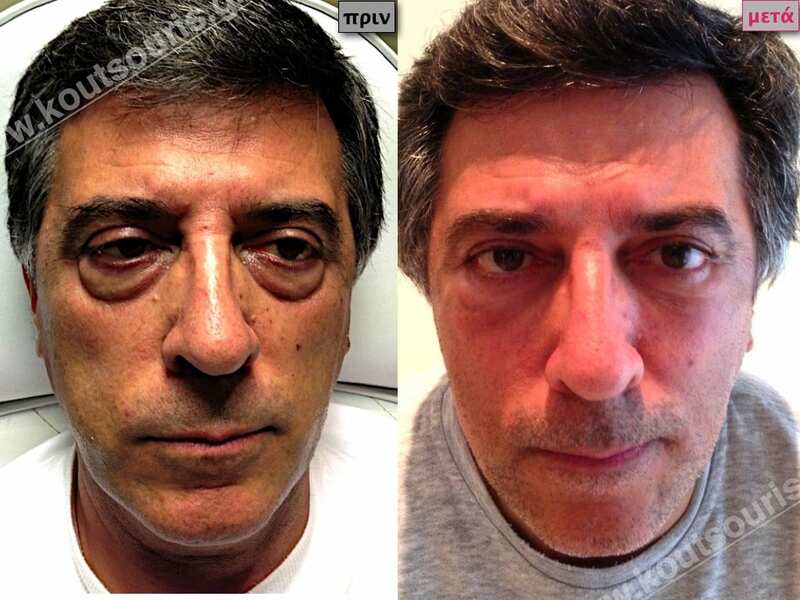 As we grow old, the constant frowning activity of the muscles mentioned above “carves” the glabella region and usually creates one or two unsightly deep wrinkles similar to creases. The real reason of appearing wrinkles in the glabella region is the constant muscular contraction of the three muscles, which create over the years a “hollow” in the glabella region, like there is a tissue deficit. 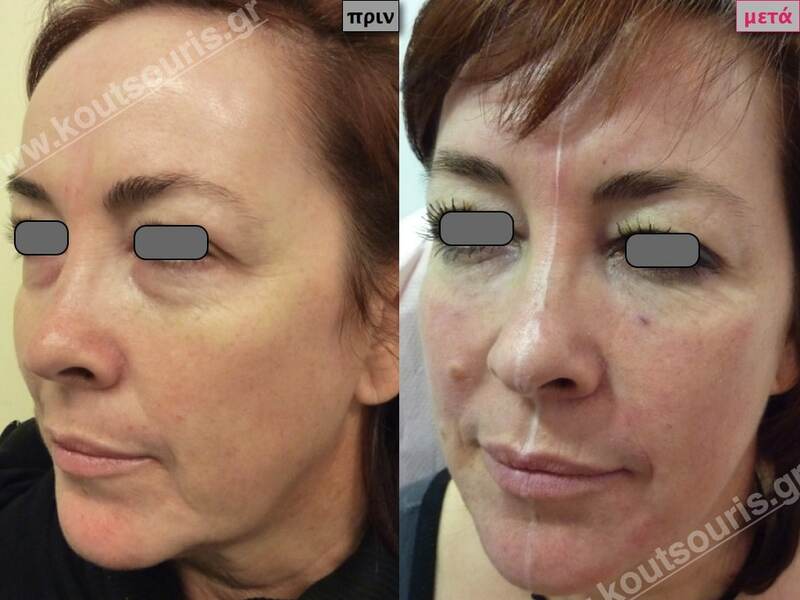 The improvement or disappearance of glabella wrinkles can be possible with the combination of two treatments: Botulinum toxin (firstly) and (then) Hyaluronic Acid. 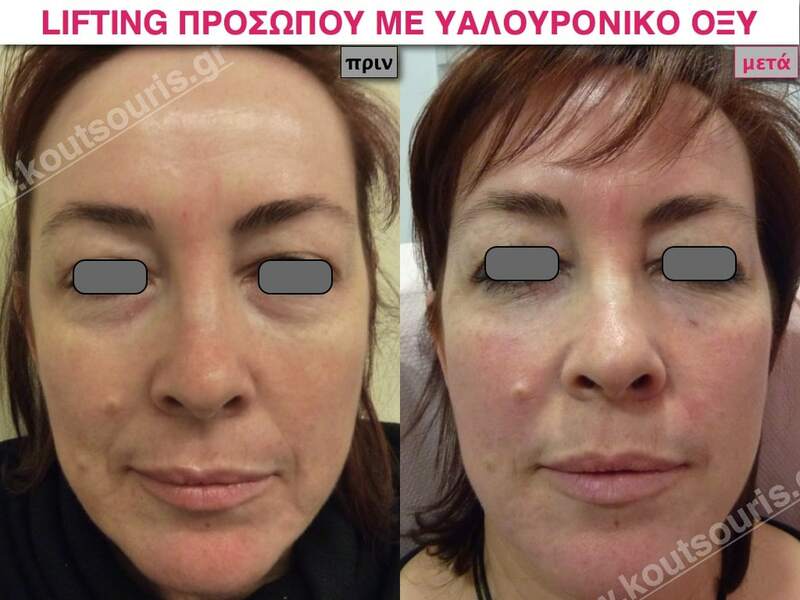 ΒΟΤΟΧ (also known as botulinum toxin) when selectively applied on the procerus and the corrugator supercilii muscles, deactivates the action of these muscles, responsible for the appearance of the glabella wrinkles. This way, the muscles are not contracted and the wrinkles are getting smoother. 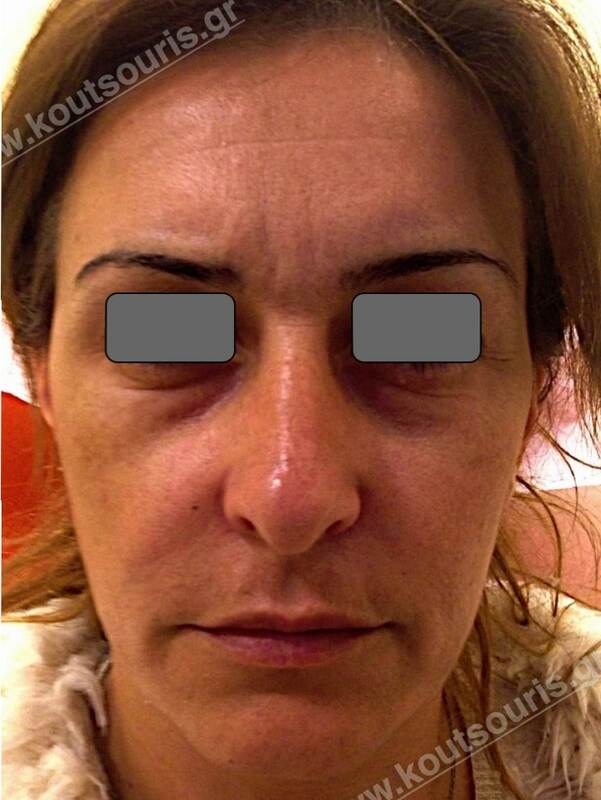 Botulinum toxin contributes in the glabella wrinkles getting smoother, but not totally disappearing. 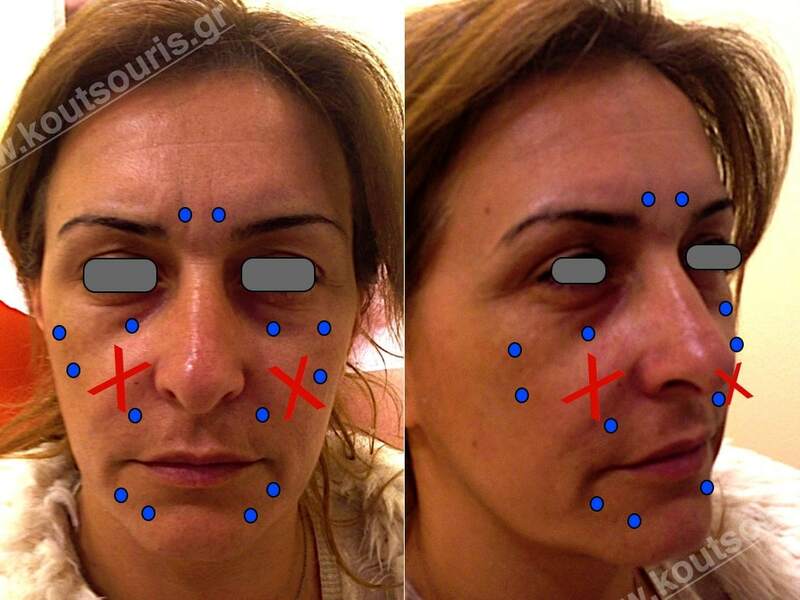 In such a case, one week after the Botulinum toxin we should proceed with the application of injectable Hyaluronic Acid on the glabella region in order to disappear the unsightly wrinkles by 100%. It very impressive that a deep glabella wrinkle takes about 15-20 years to be formed, while it takes only 10 minutes to disappear, with only two Botulinum toxin and Hyaluronic Acid sessions. 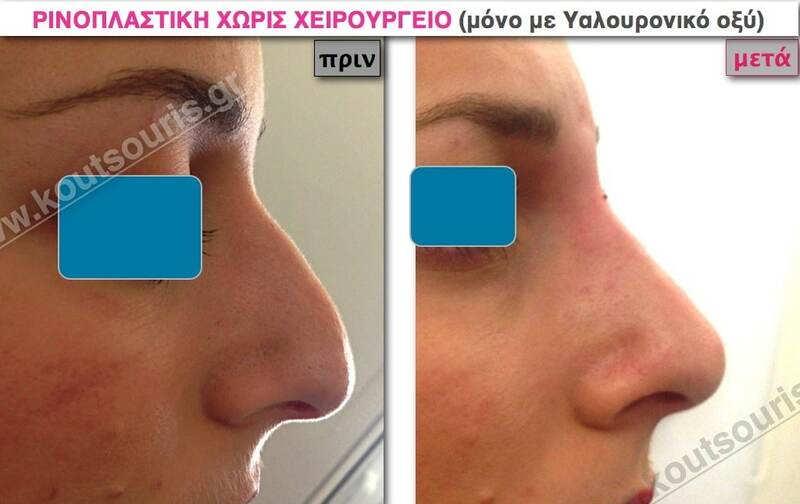 Is it possible to have a non-surgical Rhinoplasty by only using Hyaluronic Acid? 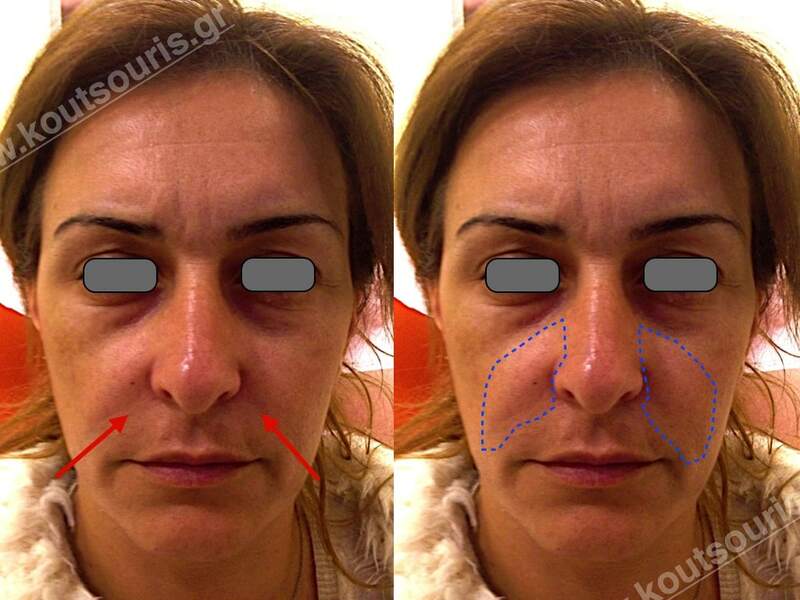 Today we have the chance to solve the problem of a misshapen nose, which is an unpleasant characteristic for many people, without having surgery. 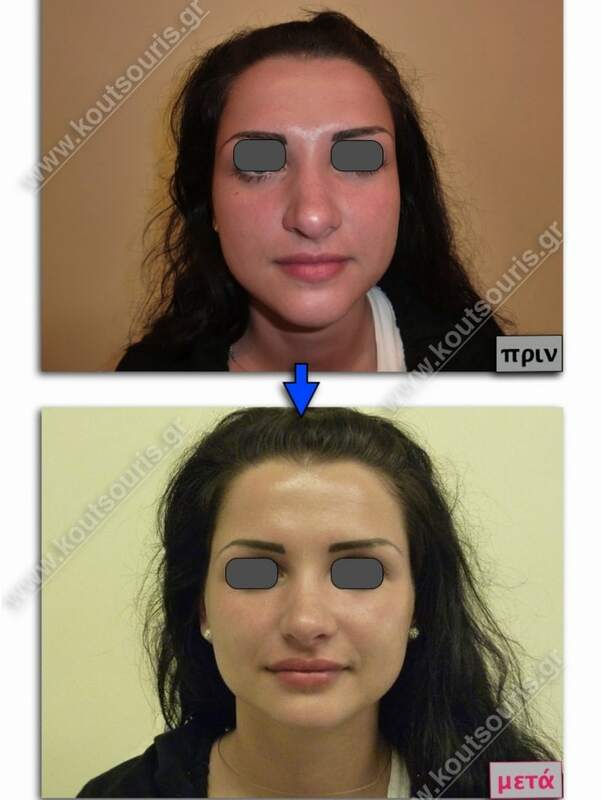 The technique of a non-surgical Rhinoplasty is primarily based on the fact that we have a thorough knowledge of the nose frame parts, which appear some tissue deficits or hollows. With the aid of technology we then fill them using injectable Hyaluronic Acid. 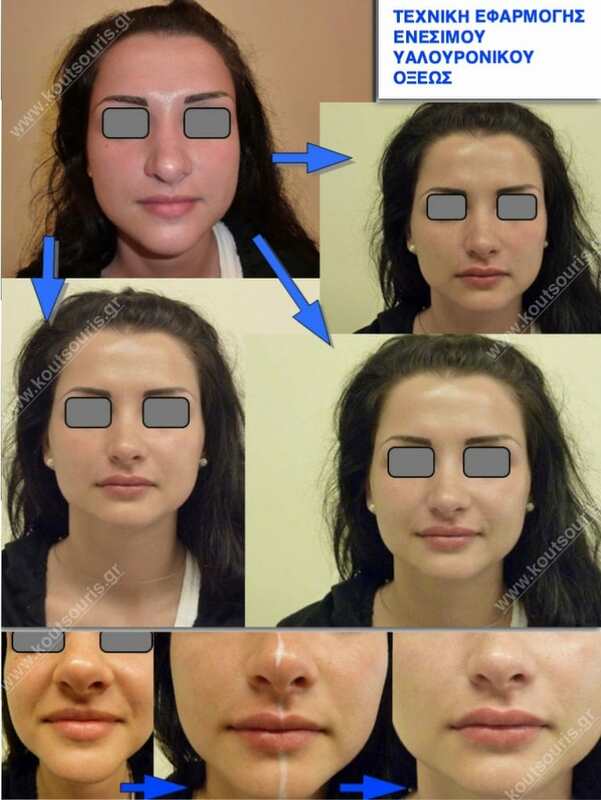 This non-surgical nasal reconstruction is suitable for people with a normal respiratory function or medium level deformities of the nose frame as well as for people with small or medium sized bridge of nose and medium level deformities on the apex nasi and the nasion. 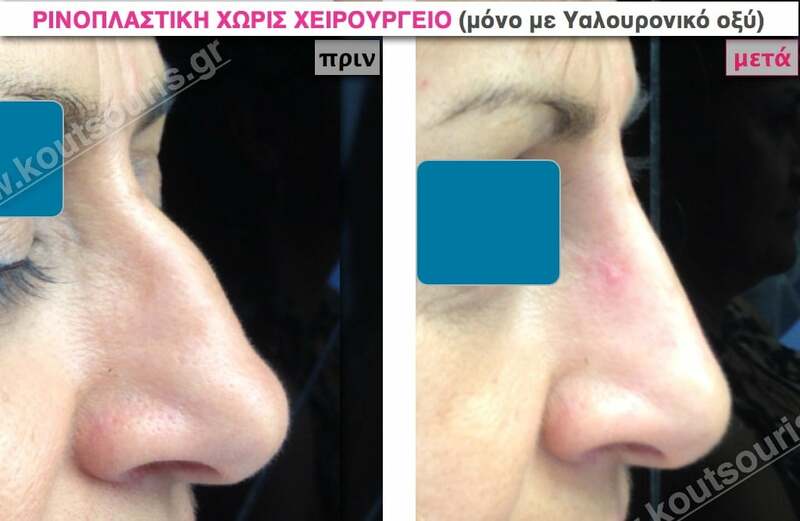 What is the application procedure of the Hyaluronic Acid according to the technique of the non-surgical Rhinoplasty? 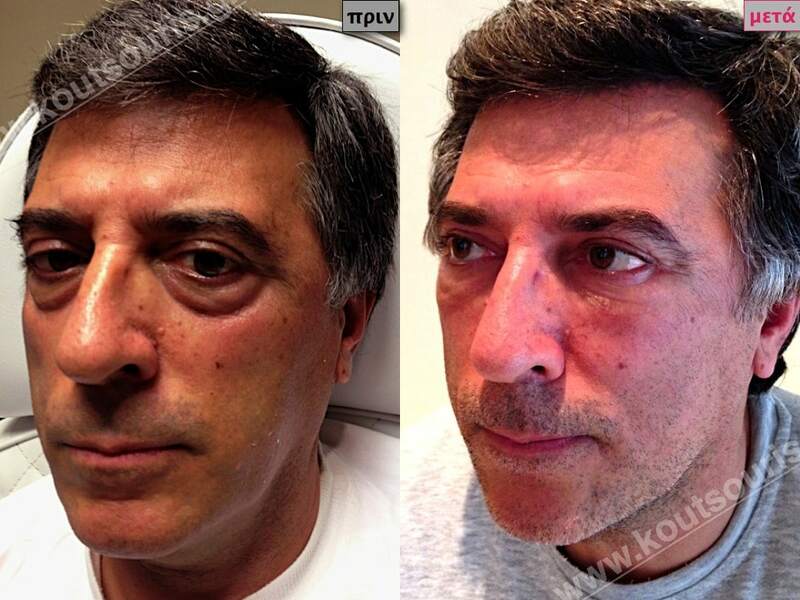 Does the application of the injectable Hyaluronic Acid hurt? 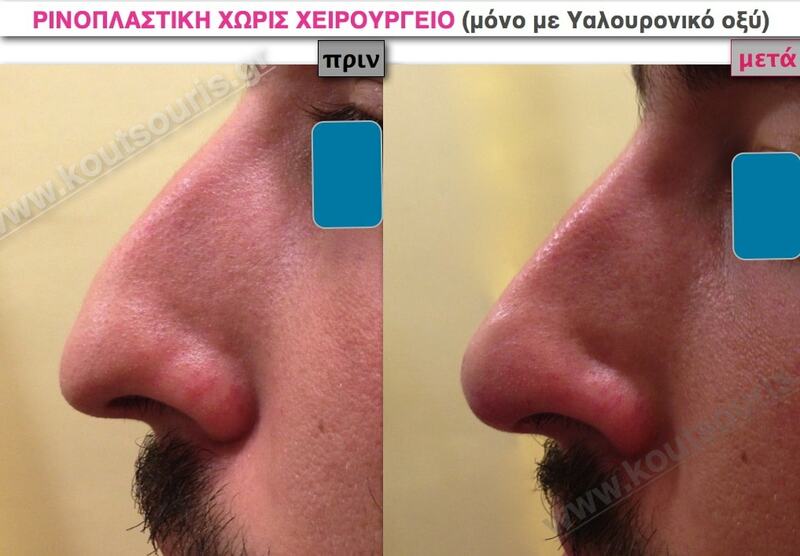 The non-surgical Rhinoplasty is a normal treatment, which takes place at the clinic. It is a painless procedure, since local anesthetic cream or local anesthesia is always used. 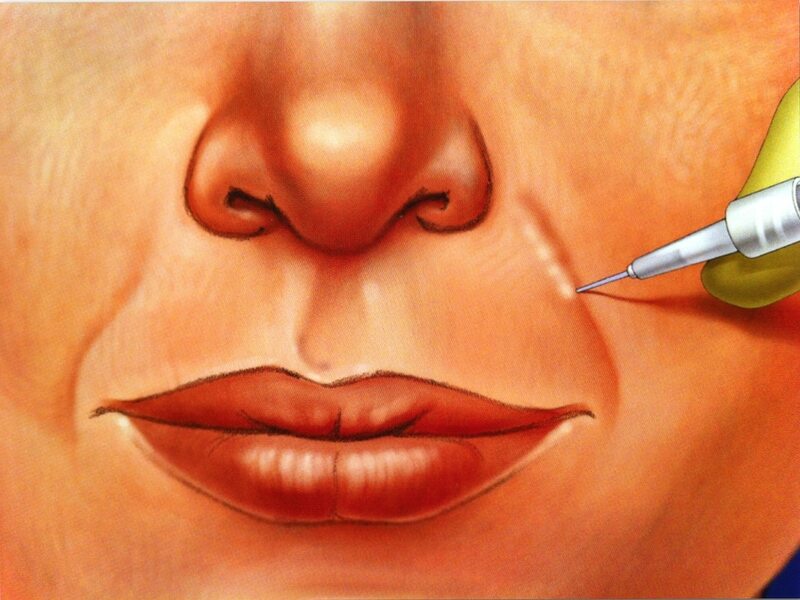 After the examination of the dysmorphic points that we have to reconstruct, we proceed with the local anesthesia and the injection of Hyaluronic Acid with the help of a super-fine needle. 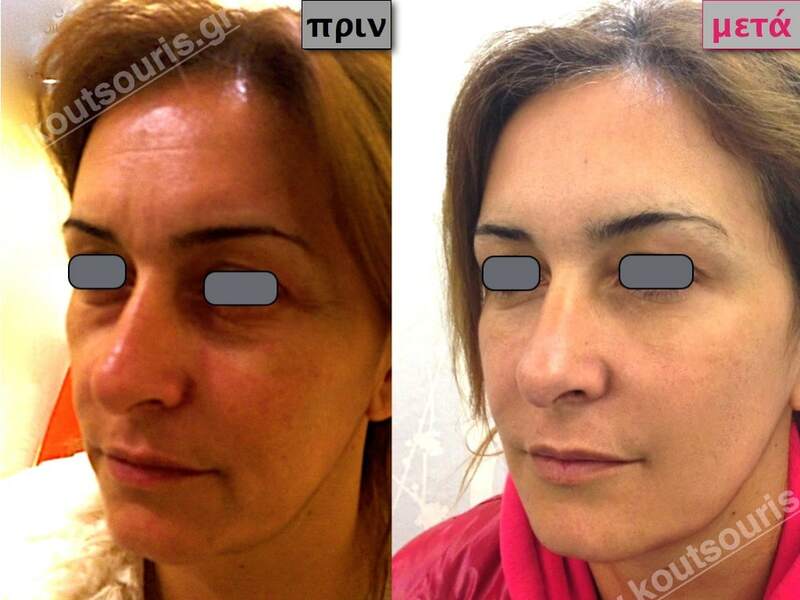 The whole procedure takes 10-15 minutes and the results are immediately visible. After the treatment it is required to apply ice at the injection sites for 2 hours approximately. 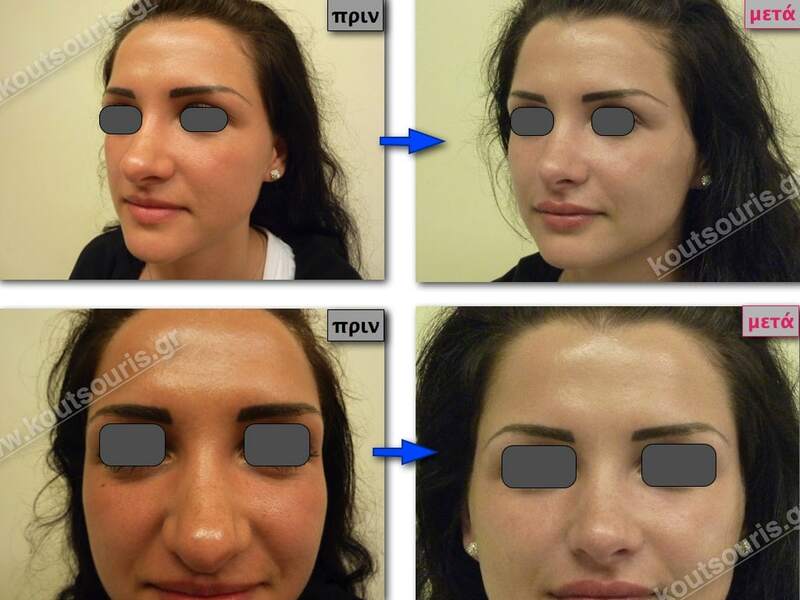 Afterwards there may appear a slight skin irritation and swelling at the injection sites, which usually disappears within 24-48 hours and can be easily covered with the use of make-up. 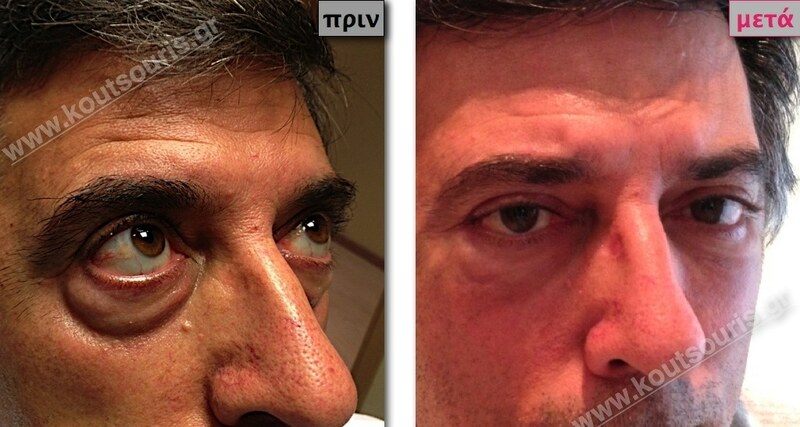 How long will last the results of the non-surgical Rhinoplasty? 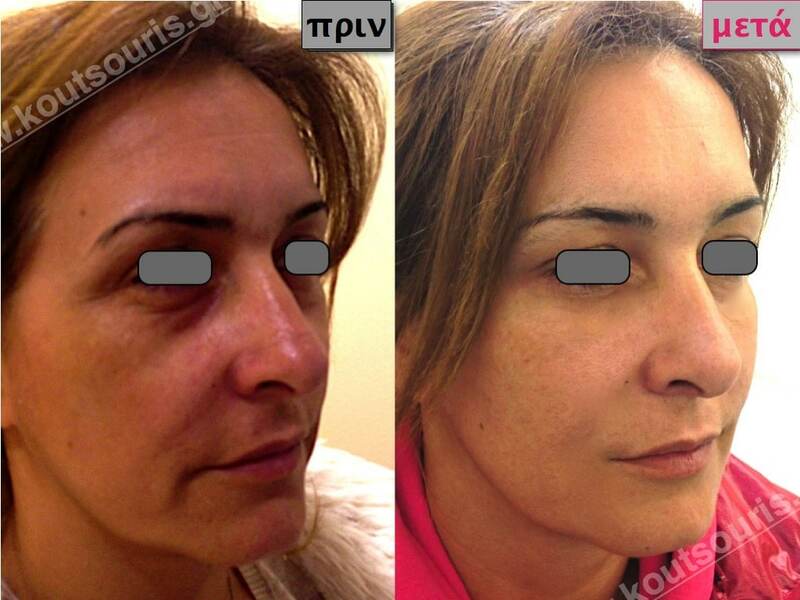 The Hyaluronic Acid is not a permanent material but can be gradually absorbed by the tissues. Specifically the Hyaluronic Acid in the nose area is absorbed at about 5 % to 15 % within the first year. Simply said, this means that the Hyaluronic Acid does not disappear after one year, but it remains at a rate equal to 85%-90%. In order to maintain a successful result, it is necessary to refill the amount of the absorbed Hyaluronic Acid. 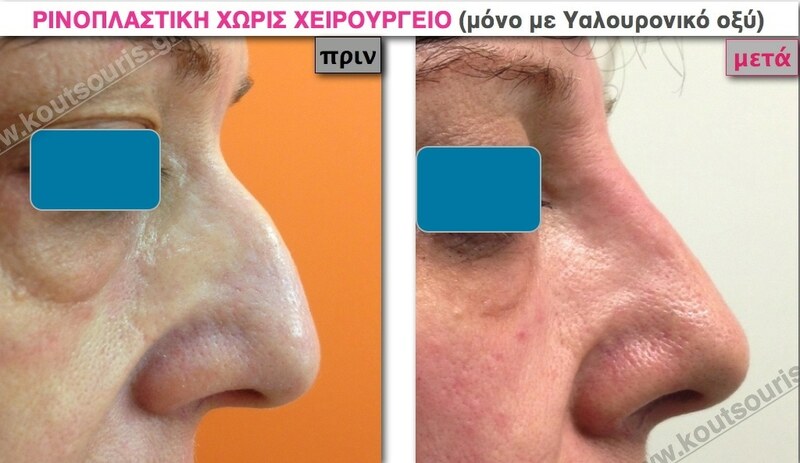 Is it possible to correct any nasal imperfections or disfigurements, which have been caused after a car accident, oncologic surgery or af ailed Rhinoplasty surgery by using Hyaluronic Acid? 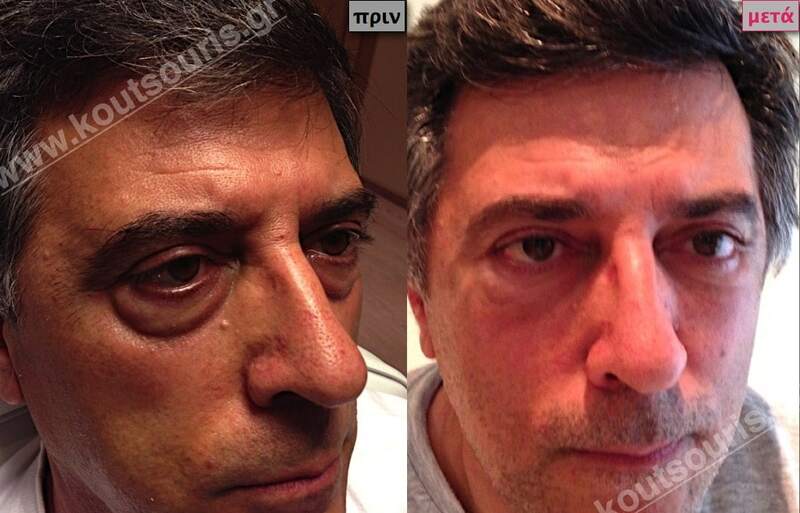 When a nose has been damaged by an accident or a surgery, then it may appear a tissue deficit or disfiguring of morphology. 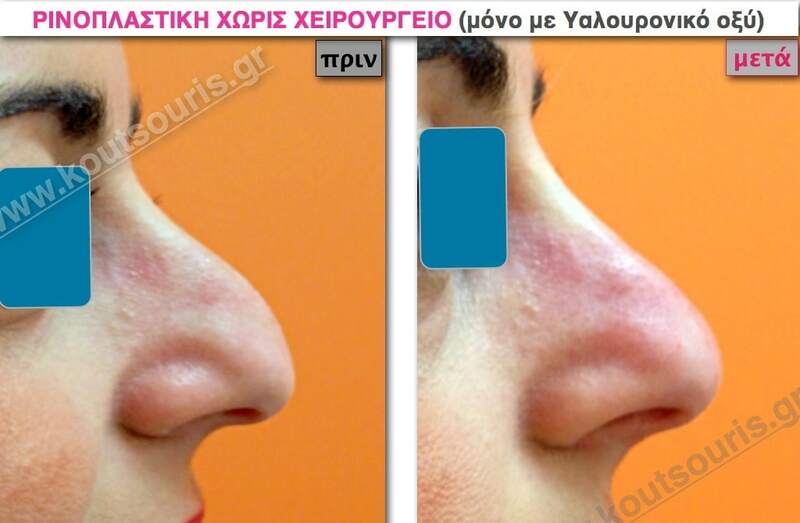 In order to correct or reconstruct the nose disfigurement we can apply Hyaluronic Acid in certain areas of the nose. 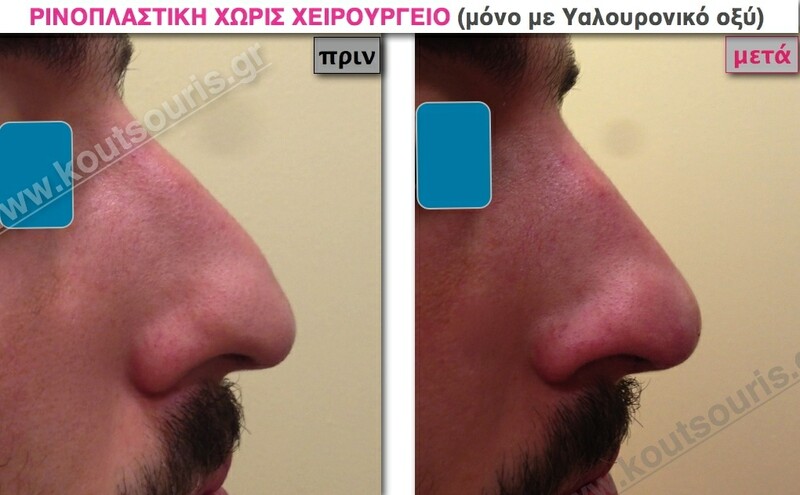 It is very common that a surgery or an injury may change the nose anatomy and modify the blood supply of the tissues, a fact that makes dangerous any additional surgery for the functional or aesthetic rehabilitation of the area. 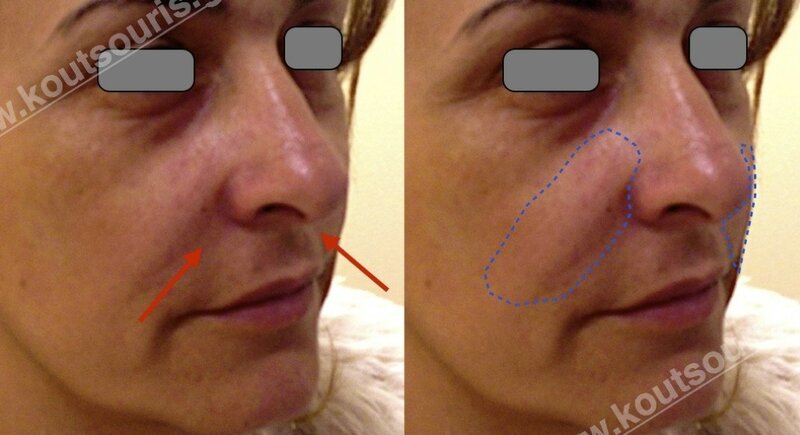 In order to reconstruct any tissue deficits or other disfigurements using injectable Hyaluronic Acid without undertaking an (additional) surgery, we should always respect the anatomy of the injured nose. Having these rules we can reconstruct most of bad operated noses with big safety and great predictability. 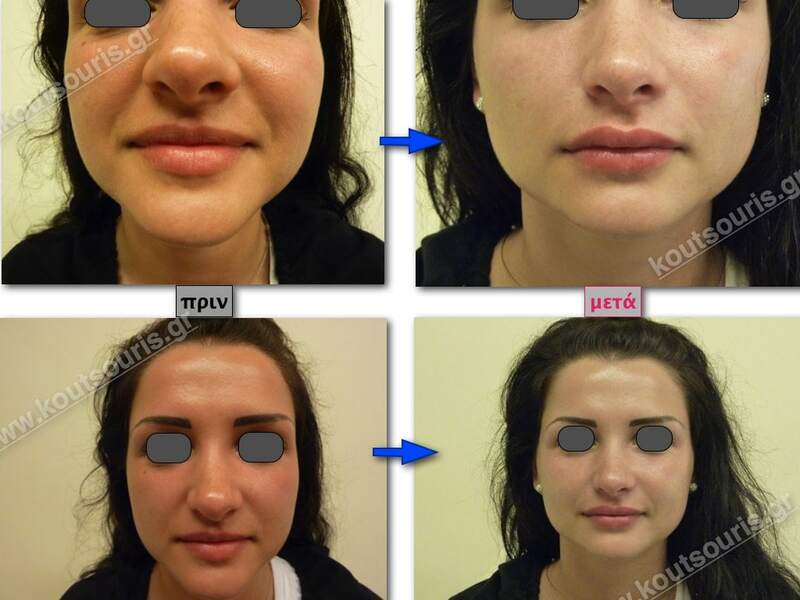 What is the aim of getting a lip augmentation? Full lips are considered to be more beautiful and sensual than just big lips. Big and fleshy lips do not suit all faces. Fine facial features, flat cheekbones or small noses, cannot be combined with big lips for “balance” reasons. In order to achieve a pleasant and safe result, it is necessary for the doctor to have a thorough knowledge of the face anatomy and of the aesthetics so as to avoid any kind of exaggeration. Simply said, our primary aim is not to plump the lips but rather to give them a sufficient volume and beautiful shape, without giving the impression that we had any intervention. The most adequate injectable implant for the lip augmentation is the Hyaluronic Acid. In which case should we get a lip augmentation using Hyaluronic Acid? The Hyaluronic Acid is used in order to correct the imperfections of the lip shape or size of both men and women. The image of some women is very characteristic when they try to make their lips more “intense” by tattooing or applying a lip liner either on the skin around the lips or above the lipstick. The result is an extremely unnatural and unsightly image. The solution for the small and atrophic lips is not the lipstick or the lip liner, but rather the augmentation and the lift of the lip red pulp by using Hyaluronic Acid. It is also worth mentioning that as we grow old the lips of both men and women become more atrophic and smaller. This practically means that the lips are getting wrinkled, soft and flat, losing their volume. It is very characteristic that the lipstick of middle age and elderly women is lost in multiple, small, vertical lines along the lips. The lips look like a deflated balloon. The solution for the lips of middle age and elderly women is the application of Hyaluronic Acid into the lip pulp and along the length of the lips in order to get back the size and the shape of their lips that they had at the age of 20-25. In such a case we do not want a lip augmentation but a restoration of their past image. 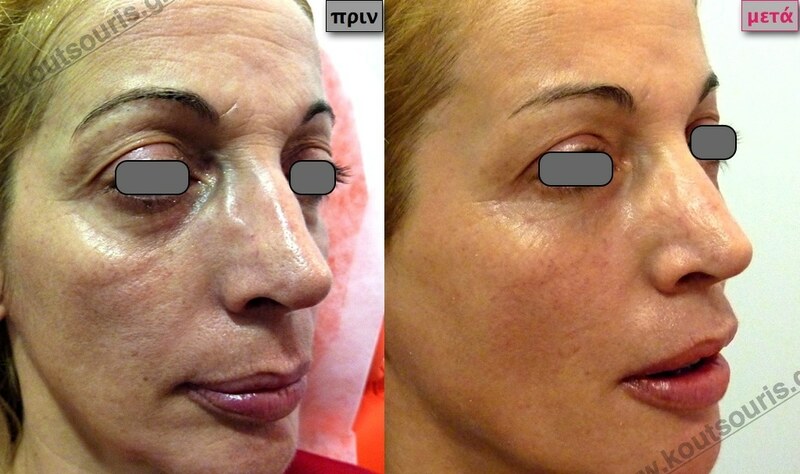 What is the procedure of augmentation / correction of the lips using Hyaluronic Acid? In the area of the lips we apply a local anesthetic cream for 20-25 minutes in order to avoid pain. We inject a free-flowing implant of Hyaluronic Acid with the help of a super-fine needle into certain areas in the pulp of the lip as well as in the lip contour, respecting the anatomical features of the area. Afterwards there may appear a slight skin irritation and swelling at the injection sites, which usually disappears within 24-48 hours and can be easily covered with the use of make-up In most of the cases, people can normally go back to work the next day. The whole process takes about 40 minutes. In order to have a complete and perfectly controlled result, it is necessary to repeat this treatment twice within 7-10 days. Is the application of injectable Hyaluronic Acid in the area of the lips safe? address to a plastic surgeon, who has a great experience and familiarity with those techniques as well as an in-depth knowledge of anatomy. At what age should we apply Hyaluronic Acid into the lips? There is no age limit for applying injectable Hyaluronic Acid into the lips. In general terms and depending on the problem it can be done at any age but we usually recommend starting it after adolescence. In most cases, individuals 20-35 years old worry about the small size of their lips, while individuals after the age of 40 worry about the augmentation and correction of their small, atrophic and wrinkled lips, as a result of their age. 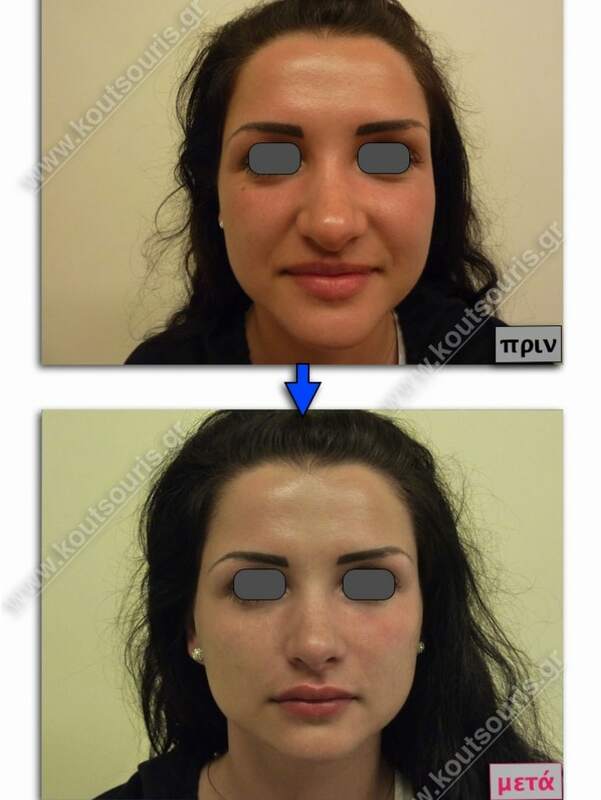 How long does the result of lip augmentation last? The Hyaluronic Acid, which is used for the lip augmentation, is a little more free-flowing than this for the face, so as to be invisible and intangible. Consequently it can be easily cleaved by the human organism and is absorbed at about 20% to 25% within 8-10 months. Simply put, the Hyaluronic Acid remains after 8-10 months at a rate equal to 75% -80%. In order to maintain a successful result, it is necessary to refill about the 20-25 % of the amount of the absorbed Hyaluronic Acid every 8-10 months. Since the molecule of the Hyaluronic Acid is almost similar to that in the human tissues, the injectable Hyaluronic Acid is highly safe. Is it true that that the Hyaluronic Acid has an ANTIDOTE? The mechanism of action of the ANTIDOTE hyaluronidase is an enzymatic proteolysis, i.e the hyaluronidase fragments the molecules of the Hyaluronic Acid, which is finally broken down into aminoacids absorbed by the human organism. Simply put, even if we are not pleased with the result of the Hyaluronic Acid application or in the case there is any malformation of the characteristics due to its wrong application, then we can use at any time, immediately or untimely, the ANTIDOTE hyaluronidase in order to remove the excess amount of Hyaluronic Acid or to place it in the right position by restoring the image at 100%. 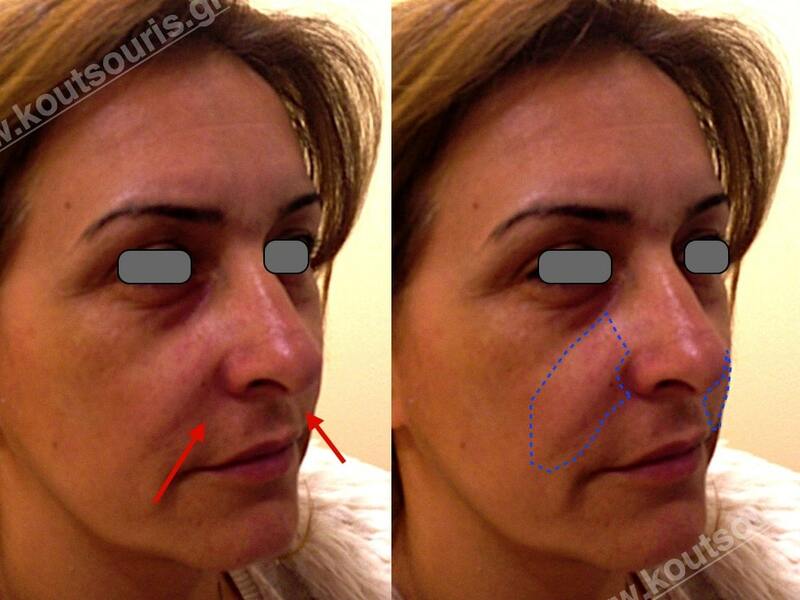 Could the injectable implant of Hyaluronic Acid cause any malformation in the facial features? The Hyaluronic Acid is a highly safe material, used for filling any hollows or adding volume to the atrophic spots of the facial tissues. This way we can practically lessen the depth of, or eliminate the facial wrinkles. 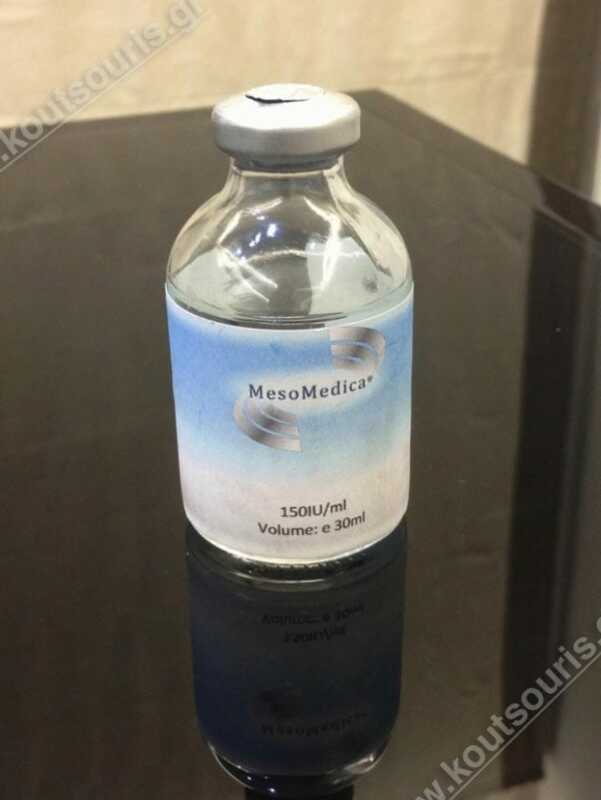 If a plastic surgeon misplaces the Hyaluronic Acid or uses an excessive amount of it, then this might cause an image deterioration or malformation. Fortunately, in such cases, there is a solution, which is the ANTIDOTE hyaluronidase mentioned above. 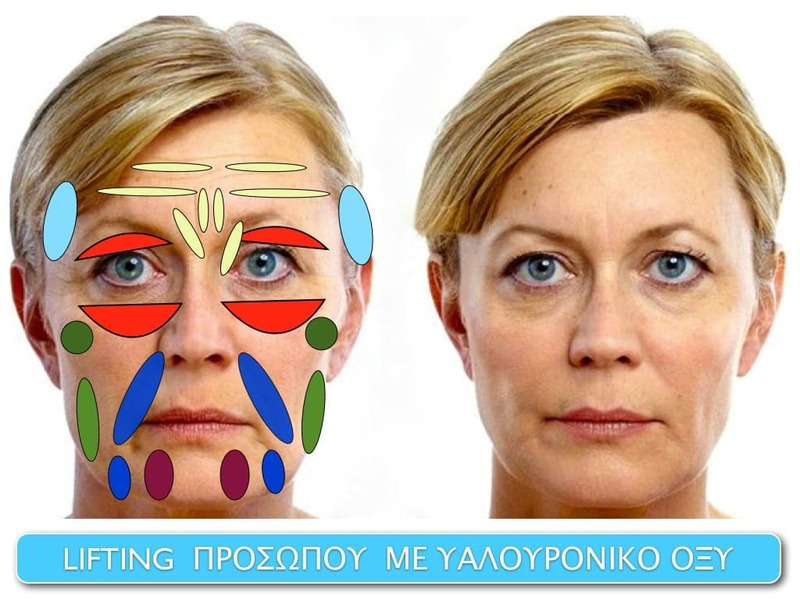 a profound understanding of the facial mechanisms. What is the application procedure of the ANTIDOTE Hyaluronidase if the Hyaluronic Acid has been misplaced or used in an excessive quantity? 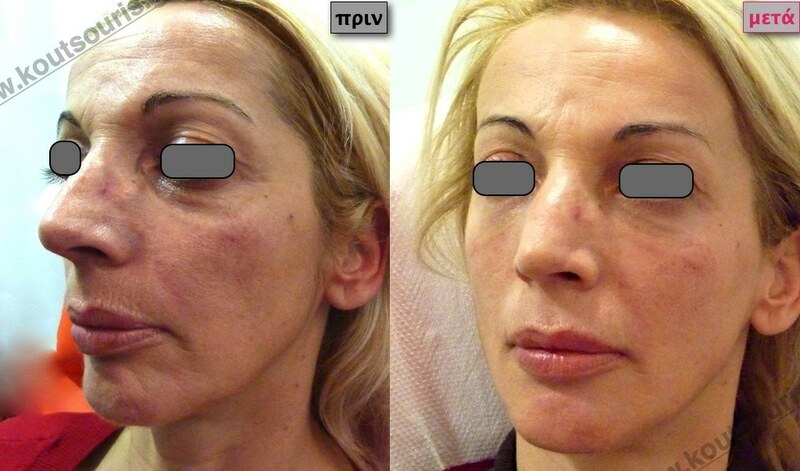 If the plastic surgeon has misplaced the Hyaluronic Acid or has used an excessive quantity of it, then we can easily remove the excess using the injectable ANTIDOTE of Ηyaluronidase. When the ANTIDOTE interacts with the Hyaluronic Acid, then it immediately breaks it down and transforms it into a fluid liquid (from viscous gel), which is cleaved and absorbed by the human organism. 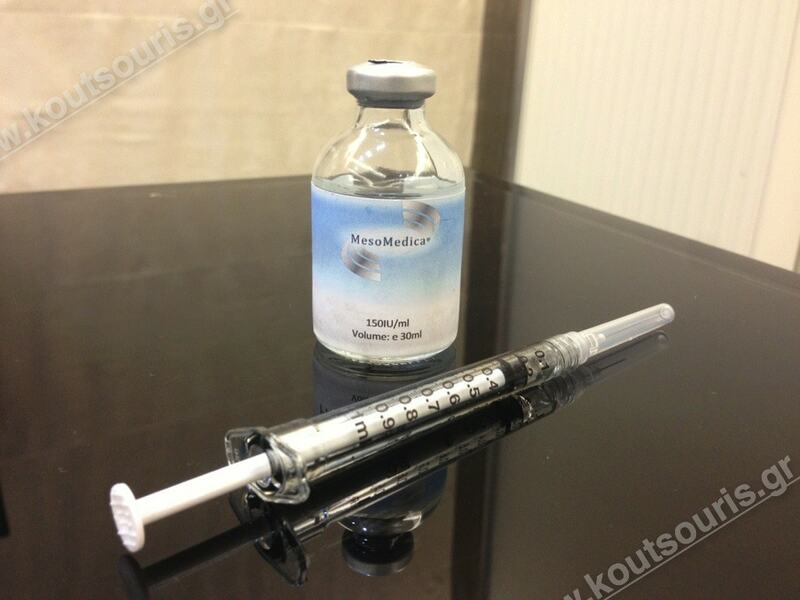 Usually, in order to dissolve the Hyaluronic Acid, it is necessary to apply the ANTIDOTE once or twice (max.). 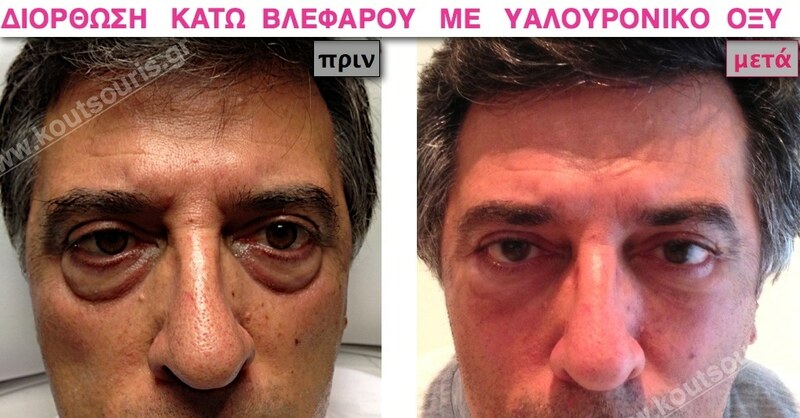 By injecting the ANTIDOTE of Hyaluronidase the face can be restored at 100% in its former state. 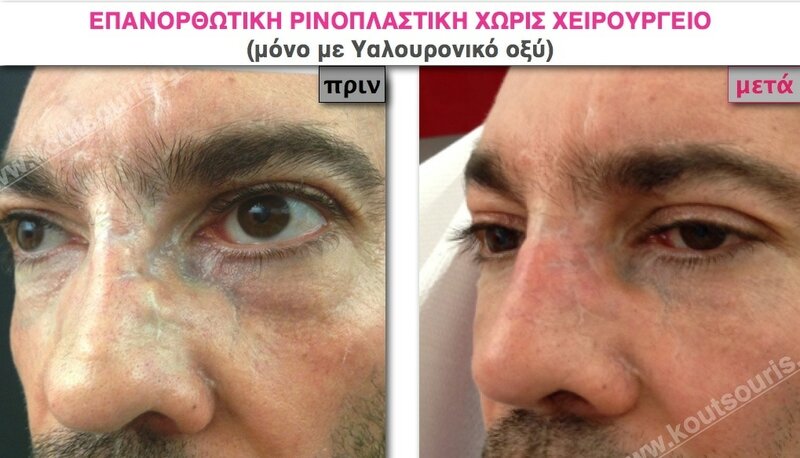 This is one of the greatest advantages of the injectable implant of Hyaluronic Acid, since it is a highly safe material. What is the most common mistake after the application of Hyaluronic Acid to the face? The most common mistake that happens to a face after the application of Hyaluronic Acid is the misplacement of this injectable material. But what does this stand for? 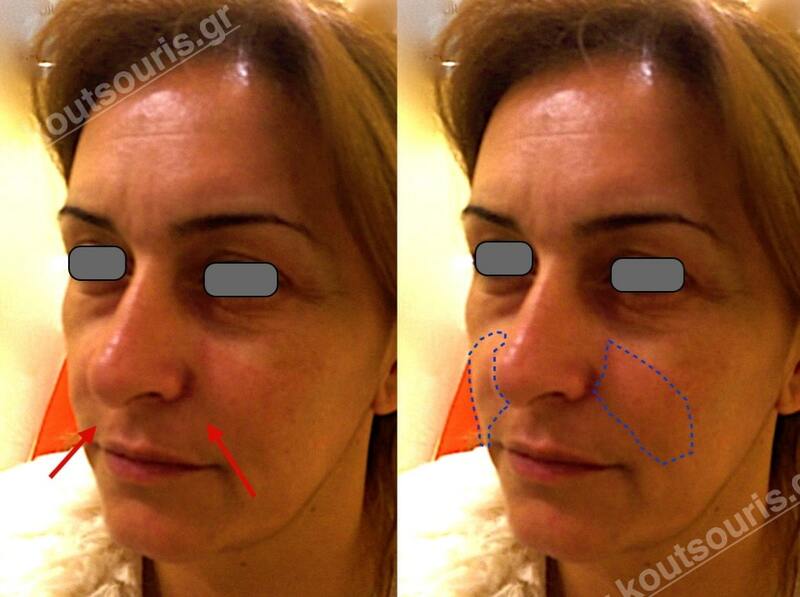 As shown in the pictures below, a plastic surgeon injected Hyaluronic Acid only into the nasomalar grooves, i.e on both sides of the nose and the lips, considering that it was the best solution for the elimination of the facial wrinkles. (See the red arrows on the pictures on the left column). However, the misplacement of the material, created a malformation bulge instead of correcting the wrinkles which looks like a “candy” in the marginal gingival grooves, something that did not exist before the application of the material. (See the dotted blue lines in the pictures on the right column). The wrong application of the Hyaluronic Acid into a face is a common mistake of doctors, not very familiarized with these contemporary techniques and aiming at fulfilling the desire of each patient, that inject Hyaluronic Acid only into the nasomalar grooves (see red arrows). This application “flattens” the nasomalar grooves but deforms the image of the face, since it swells up the soft molecules right above the nasomalar grooves (i.e the area inside the dotted blue lines). 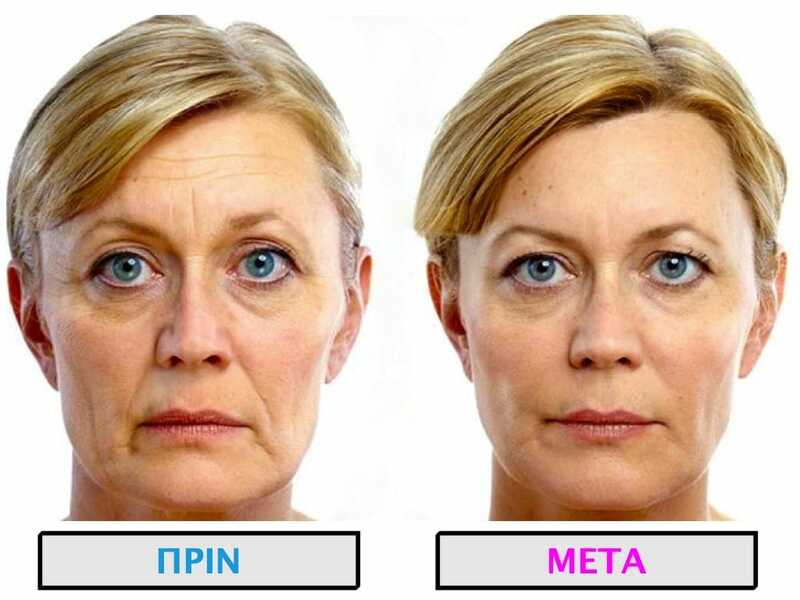 Since the face is not getting older only by two lines, found on both sides of the nose or the lips, the aging process concerns not only the face but also all tissues. For this reason the Hyaluronic Acid should be applied to all facial areas. 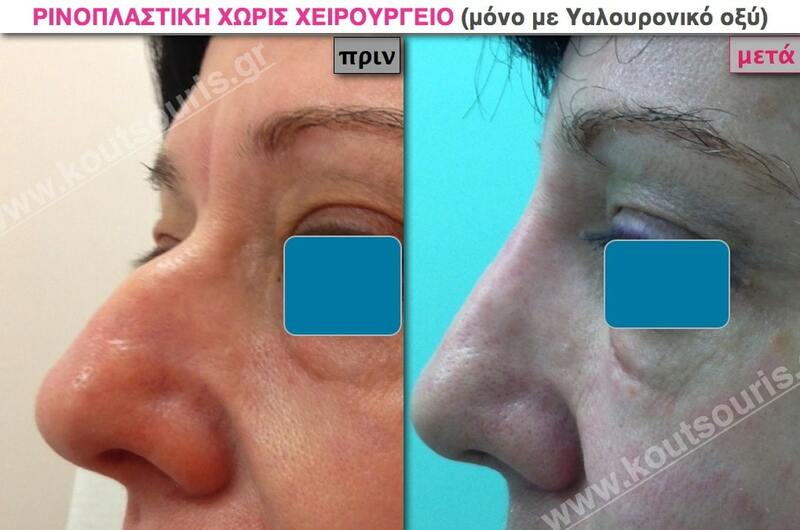 AND DO NOT PUT HYALURONIC ACID ONLY AT the Wrinkles of the nasomalar grooves, on both sides of the nose. Hyaluronic Acid should not be applied in isolated areas, so as to equally allocate the implant all over the atrophic spots and holistically win the fight against aging of the facial features. 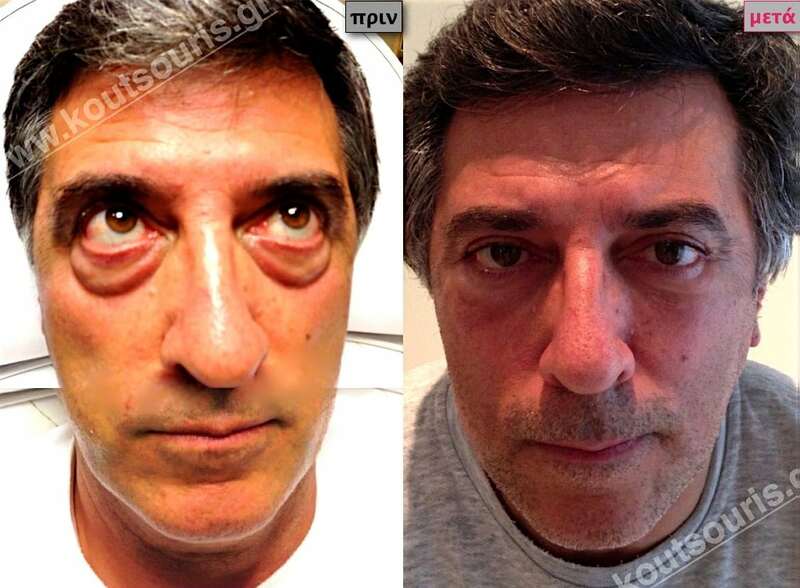 In the following pictures one can observe the correction of a malformation and the improvement of the facial features caused by the misplacement of the hyaluronic acid. 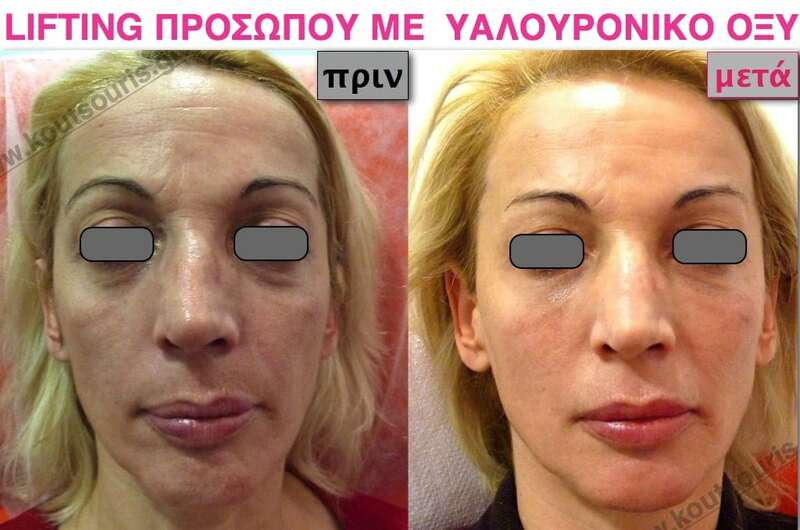 This is the only way to achieve a natural result and give freshness, harmony and revitalization to the facial features without any unpleasant results, such as deformities and malformations. How can the malformations of famous people be explained? The malformation of facial features of famous people may be a result of the misplacement or use of an excessive quantity of Hyaluronic Acid, as a result of wrong application techniques. This can be easily corrected using the ANTIDOTE HYALURONIDASE, that it will be used any period of time after the application of the Hyaluronic Acid. 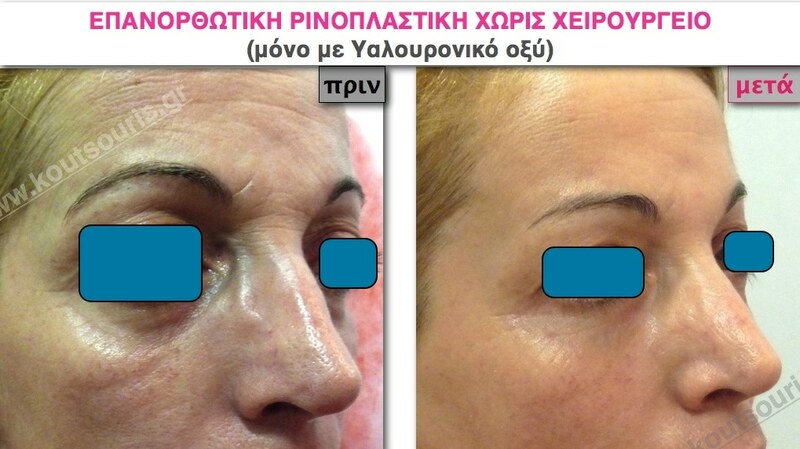 AND THEY ARE NOT A RESULT OF HYALURONIC ACID APPLICATION. The liquid permanent implants cannot be absorbed by the human organism and tend to displace and form granuloma, which can be difficultly treated surgically. THESE IMPLANTS ARE STRICTLY PROHIBITED. 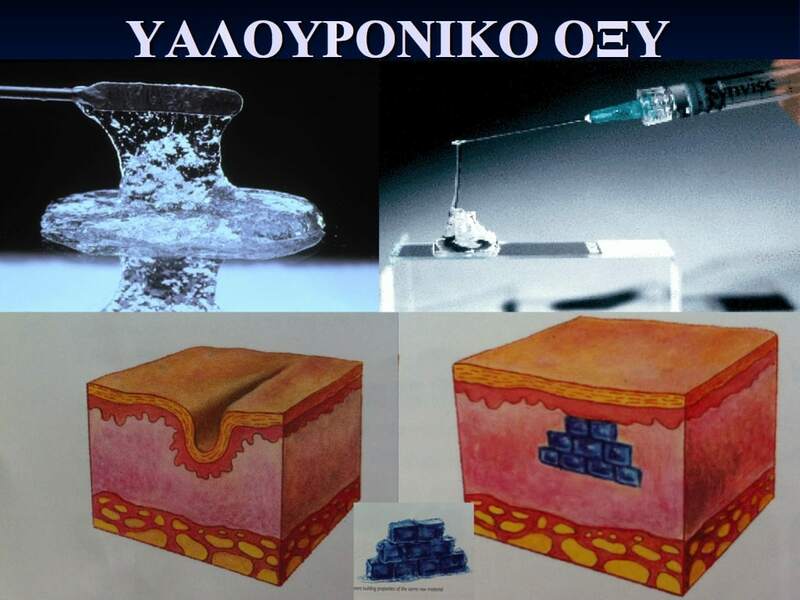 Why the Hyaluronic Acid is the most suitable implant for human tissues? The Hyaluronic Acid is the only implant, which can be easily removed anytime from the human organism with the help of an injectable antidote. it can be easily removed anytime from the human body with the help of the antidote Hyaluronidase. It should be also mentioned that the proper injection techniques are crucial for the avoidance of any side effects or complications. In order to achieve a pleasant result without having any side effects, the doctor needs to have an in-depth knowledge of the tissue anatomy and a thorough understanding of the properties of this medicine. 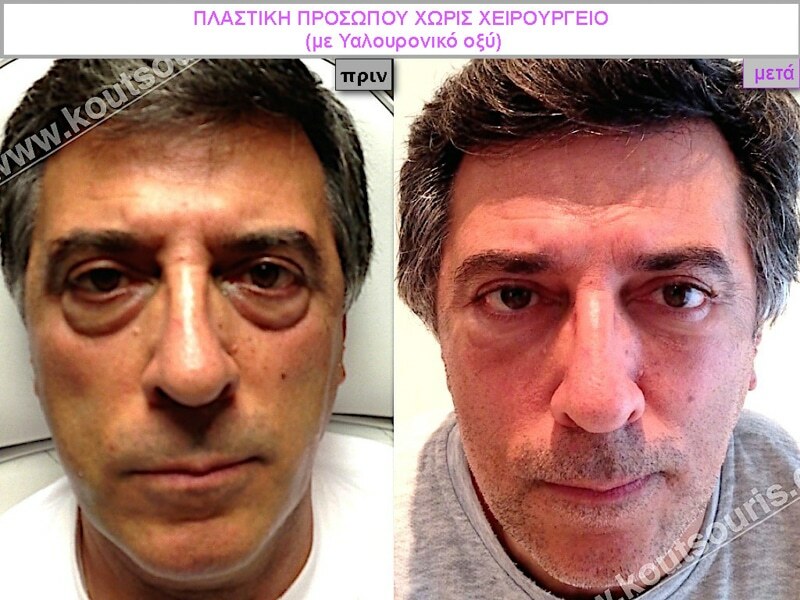 How long do the results of the injectable Hyaluronic Acid last? The life expectancy of the Hyaluronic Acid implants ranges from 8 to 16 months. Practically speaking the Hyaluronic acid is absorbed at about 15% to 30% within the first year. This means that it does not disappear after one year of its application, but it remains stable at about 85%-70%. All we have to do is to refill the quantity of the Hyaluronic Acid, which has been absorbed, in order to maintain a successful result. Density of the injection material. The more viscous the material and the deeper it is injected into the tissues, the lower its absorption by the human body’s defense mechanisms are. Also when the mobility of the Hyaluronic Acid is lower, the life expectancy of the implant at the injection site is prolonged. In most cases, the treatment shall be repeated after 10-14 months, in order to maintain a successful result. Is there any link between the Hyaluronic Acid and Botulinum toxin ? In which cases should we apply them? There is no relationship between the Hyaluronic Acid and ƁOƬOX, since they have a completely different synthesis and reason of use in intervention therapies. Specifically the Hyaluronic Acid is a viscous material, found in gel form, filling the static wrinkles and the atrophic spots of the face. On the other side ƁOƬOX is a dissolved protein in physiological saline, which does not add volume to the tissues, but smoothens the dynamic wrinkles by relaxing the muscle contraction which is responsible their appearance. ƁOƬOX corrects the dynamic expression lines in the glabella, forehead and crow’s feet, whereas the Hyaluronic Acid provides solution for the deep and finer static wrinkles formed in the perioral and periocular regions, smoker’s lines, forehead, glabella and cheekbones. 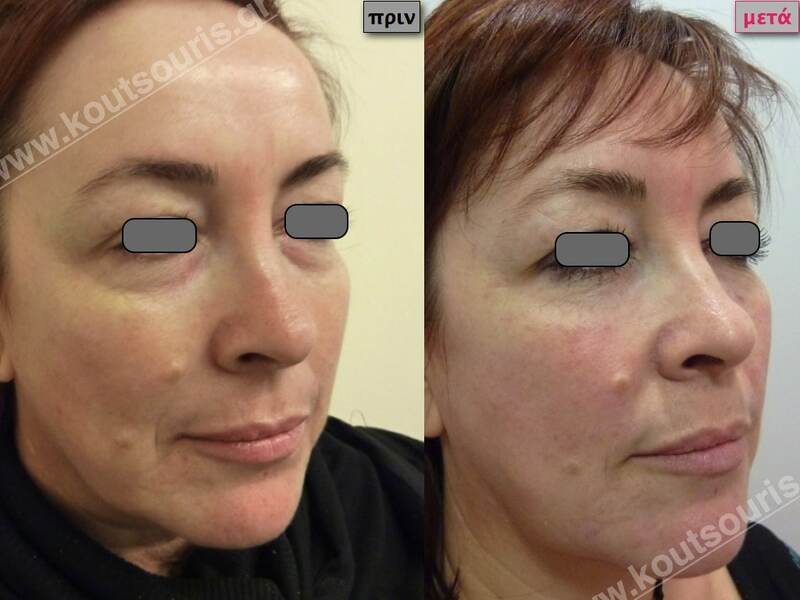 Is it possible to achieve the same result of the Hyaluronic Acid treatment using creams containing Hyaluronic Acid? There are so many creams in the market with promising results. They contain a lot of anti-aging substances, which could provide results to the skin tone and texture, but under no circumstances could they ameliorate the facial contour or reconstruct any facial wrinkles and folds. The Hyaluronic Acid’s molecules are considered to be macromolecules, i.e. substances with high molecular weight, which consequently cannot penetrate the physiological skin barrier (i.e. the barrier protecting the skin from environmental factors). So, the only way for those high-weight molecules to penetrate the skin is bypassing the skin barrier in a “mechanical” way using a needle. Generally speaking, creams are necessary and very useful in hydrating and improving the skin texture. 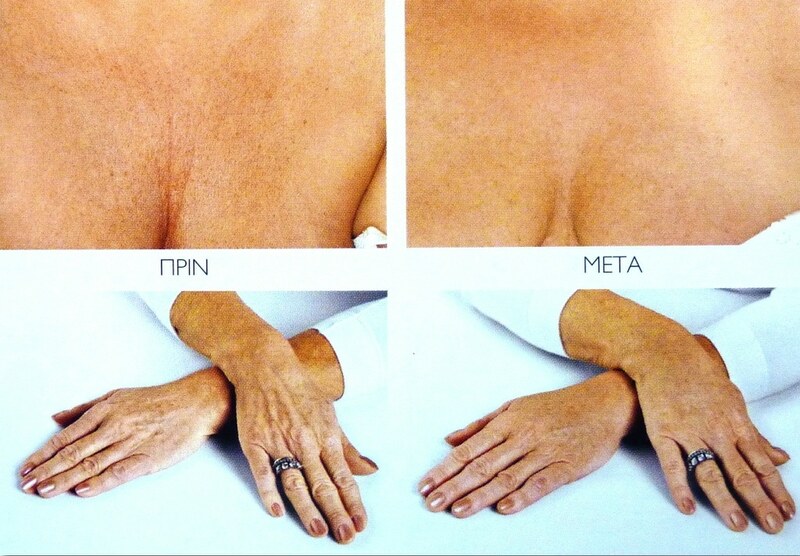 However, they provide disappointing results when it comes to the treatment against wrinkles and skin folds. The result of the Hyaluronic Acid treatment is unique and irreplaceable because it is the only way to fill what is missing in the right area. Can I achieve the results of the Hyaluronic Acid treatment if a take any food supplement, such as hyaluronic acid pills? 2nd. The oral administration of hyaluronic acid highly reduces its concentration and effectiveness. When someone is taking pills containing Hyaluronic Acid, it is necessary to bear in mind that the molecules of the medicine are allocated in the whole body. As a consequence, the low concentration of Hyaluronic Acid in the affected area does not cause any visible results. On the contrary, the injection of pure Hyaluronic Acid targets particularly the sites under treatment in order to ensure an impressive amelioration. The Hyaluronic Acid is an amazing, contemporary and safe material allowing us to achieve impressive results, even to transform in a unique and controlled way a person’s image. It is considered to be a really “MAGICAL” medicine. In addition to in depth knowledge of medicine action and the dynamics of the tissues, the perception and deep understanding of a person’s anatomical problem is a basic prerequisite. The results of the Hyaluronic Acid treatment are not only a matter of anatomy, but also a matter of perception and application philosophy. For example, looking at the girl’s picture, most of the respondents think that the main problem of her image is her big nose. 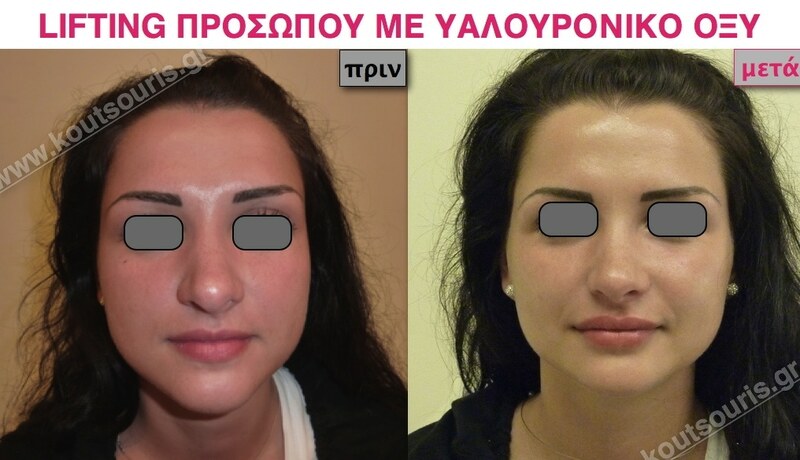 Specifically looking at her before and after pictures, they believe that her “transformation” is a result of rhinoplasty. Nevertheless, this is far from the truth. 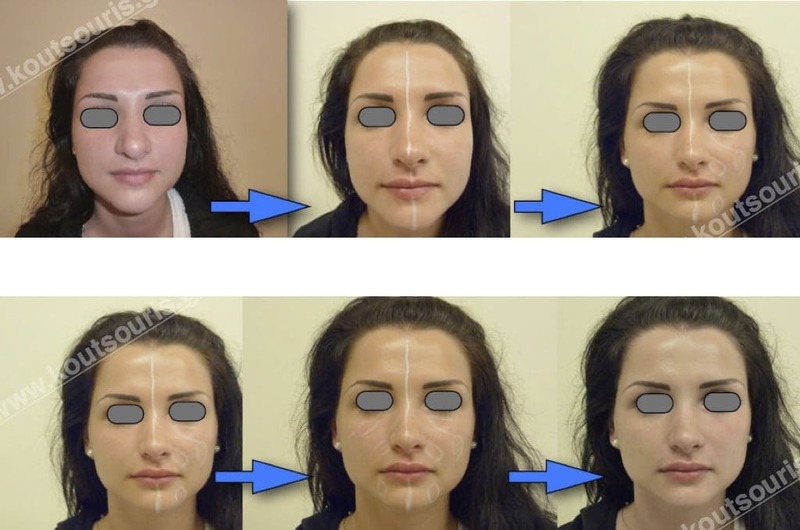 The main problem of this face is not the big nose but the fact that the vertical axis of the face (red line) is longer than the horizontal one (blue line). 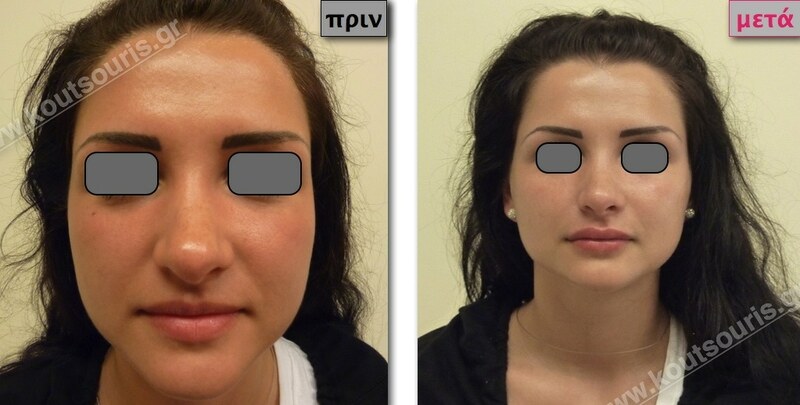 This particularity of the facial dimensions is responsible for the aesthetic disharmony of the facial features. Thus, the cheekbones look more widen and flattened, the chin more “pointed” , while the nose looks like trapped in “narrow” facial features. If we ascertain this in time, then the solution for the girl’s transformation is quite easy. 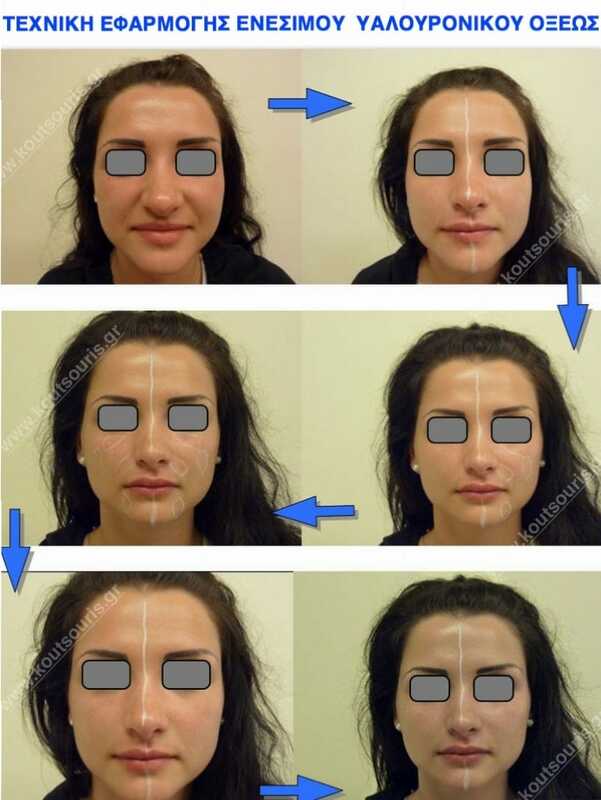 If we realize that the main problem of the girl’s image is a long and narrow face, then we can add volume to cheekbones, cheeks, sides of chin ad lips using the injectable implant of Hyaluronic Acid and correct the facial proportions increasing the horizontal axis. This way the facial features are “re-measured” around the not-that-small nose, the harmony and balance are restored and the nose is looking smaller. Everything in face is a matter of proportions and symmetry. If our philosophy is primarily focused on understanding what deteriorates the image and then our intervention to it, then it is not difficult to achieve really impressive results using injectable Hyaluronic Acid. 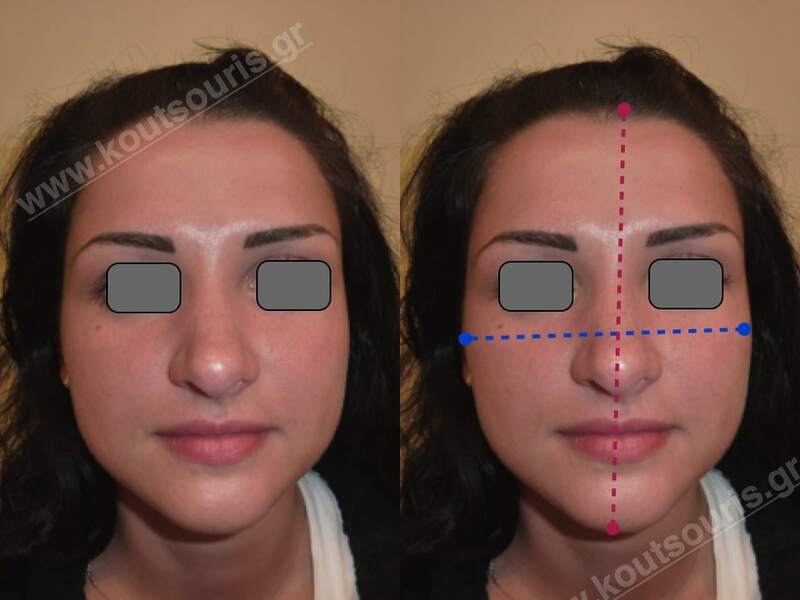 Correction of facial shape and contouring. 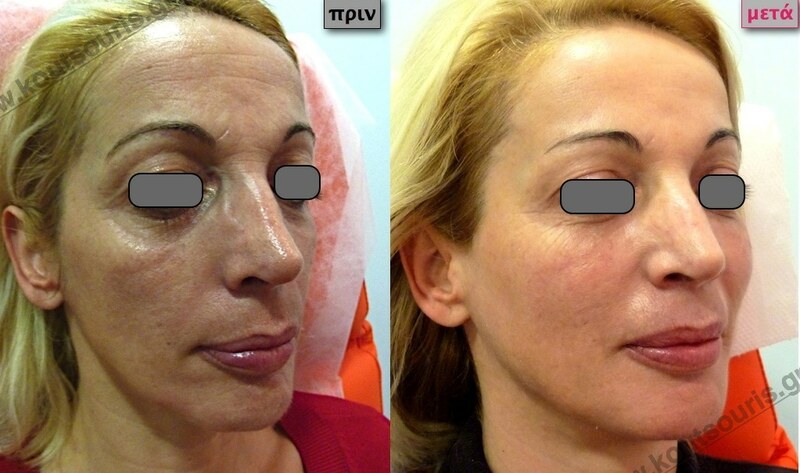 The application of Hyaluronic acid into a face is considered to be an innovative non-surgical technique. 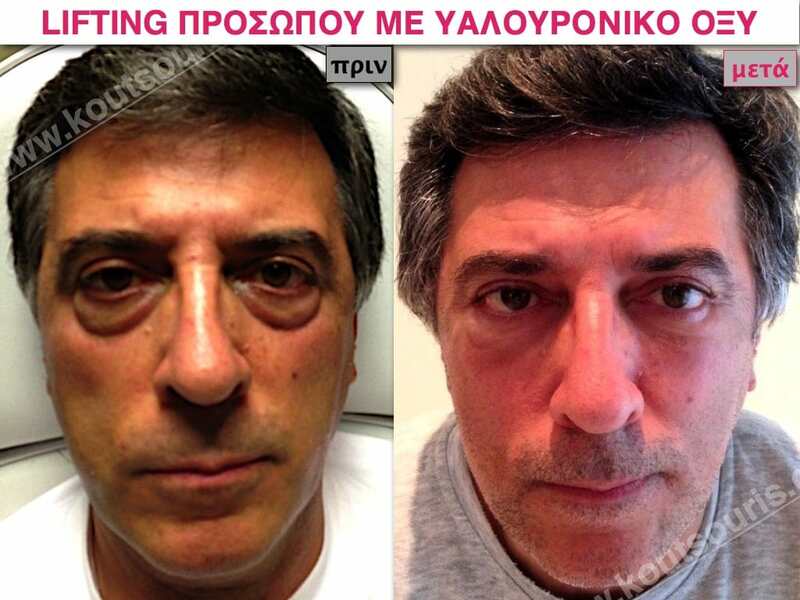 A non-surgical face lift is suitable both for men and women of all ages.